Some Casio models features the bracelet system I first encountered on the first Casio Oceanus Manta series and featured a solid pin and split collar or collet link fitting. Always an issue for folks not used to it, any resizing has to be done with considerable care and I include third parties. For example if you decide to get your local Jeweler to do this – they may very well not be familiar with this system and could very easily lose collars if not forewarned. So in the light of this and my experience with my old Casio Oceanus and now this model, I attach a couple of images to illustrate, which may help those not in the know. Note the tiny split collar (collet) in the top link hole. DO NOT LOSE THIS! 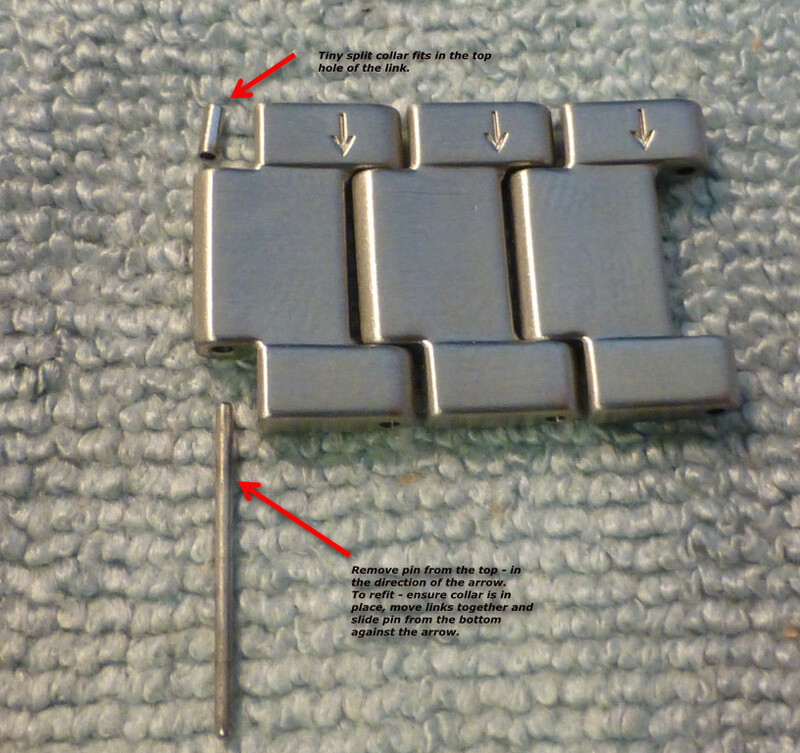 Sequence of resizing links on “collet” system bracelet. The images above can be seen more clearly by clicking directly on each one – this should open full size. The bracelet resizing is actually quite easy and I usually use a cheap blue plastic bracelet pin pusher thing you can get almost anywhere on Ebay – it does fine. It starts the initial push of the pin in the direction of the arrow – you then use a thin and longer pin pusher to fully push out the link pin (maybe assisted by a pair of pliers). Once out gently part the links and you will see the tiny collar in the link centre hole – tip it out on to your table so you don’t lose it when moving the watch and bracelet around. Once you’ve repeated this by removing the link at the end with the same procedure, re-insert the split collar and then mate the two link ends together and re-insert the pin with the arrow, fully – and you’re done. 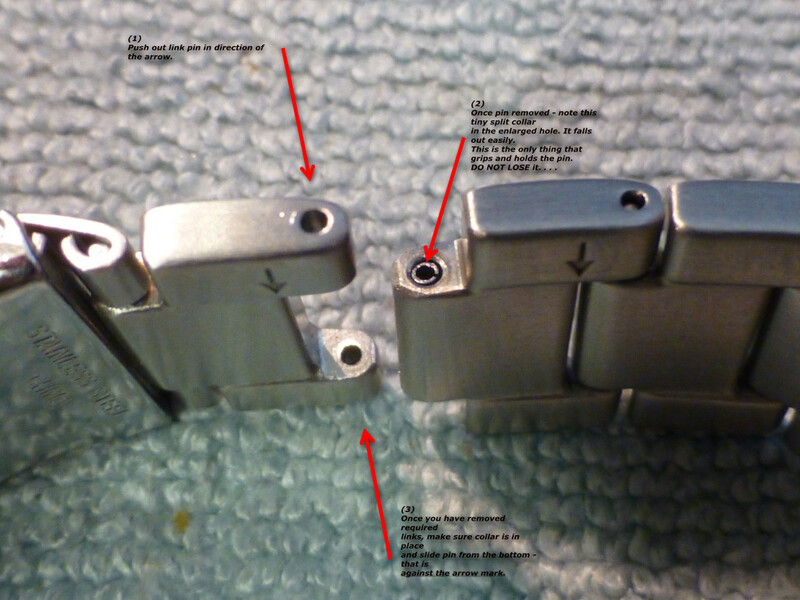 Note – On some Casio bracelets you find the small split collar (collet) on a different part of the link – so when refitting the pin, I find it better to tap it in the same direction that the collar drops into the link. Not a problem if you don’t but I’ve always found it more efficient if you do. Good information as I just bought the new Casio Oceanus model which I believe has the same kind of bracelet (just waiting to receive it in the mail)! I have a question though, after “you” using this kind of bracelets do you think it is bad? I mean will the collar always fall down if I used this little high pressure thing? The Oceanus bracelets are very good, BUT I would prefer a simpler fitting myself. However if the bracelet has the small split collar, then be VERY CAREFUL when resizing your bracelet. If you take it to a Jeweler or watch Dealer, make sure he is aware of this collar arrangement, as if he is not familiar with the collar fitting, he may also lose it. I would print off my report, so you can see what to do and also explain it to someone else if they are to resize your bracelet. Note – if you lose the collar the bracelet will not go together. If you are making the bracelet smaller, then at least you will have a few spare collars should you lose one. I also had this problem…..lost collars. Best thing was to apply drop of super glue to end of pin before tapping it home. At least it left other pins available for removeable if required. The problem lies when first re-sizing a bracelet like this. You simply have no idea there IS a little split collar in there in the first place! So as you maybe have done often in the past, you push the pin out, (but) the little collar pops out un-noticed and disappears. To put it together is not such as issue (as long as you have the collar of course) though I would personally be wary of using superglue, especially if I might sell the watch on at some point. You could for example end up with either a non flexible bracelet or another (smaller wristed) user might not be able to get the pin out at all, if they had to downsize the bracelet for them. I hear what you say and it worked for you, but basically as long as you know – then there really shouldn’t be a problem. Great thread thanks. Everything here describes my issues!! I hate this design.